Welder Katja Vironen has never worked for Kemppi, yet she has the Finnish welding equipment manufacturer’s logo tattooed on her arm. Why? For her, Kemppi’s old logo is more than just a logo. More than anything, it symbolizes finding one’s own path. When Vironen picked up the torch for the first time and started welding, her whole life changed. Having studied to become a horse caretaker, Katja had been drifting along without a goal in her life. There were no jobs in horse care and the years of unemployment were bringing her down. When the career planning psychologist more or less forced Katja, 23 years old at the time, on a welding course, she attended it unwillingly. The four-month-long course stretched into studies for more than a year. 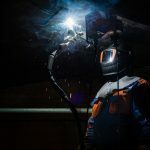 When Katja heard rumors that it is possible to weld underwater, she decided to find out where and how this could be done. “I went through an awful lot of training to study to become a professional diver, and I completed a two-part degree.” An underwater inspection degree constitutes a part of the professional diver studies, which require excellent physical fitness. In addition to Katja, as far as is known, there are only three women in Finland who have completed the underwater inspection degree. Even fewer have graduated as professional divers. 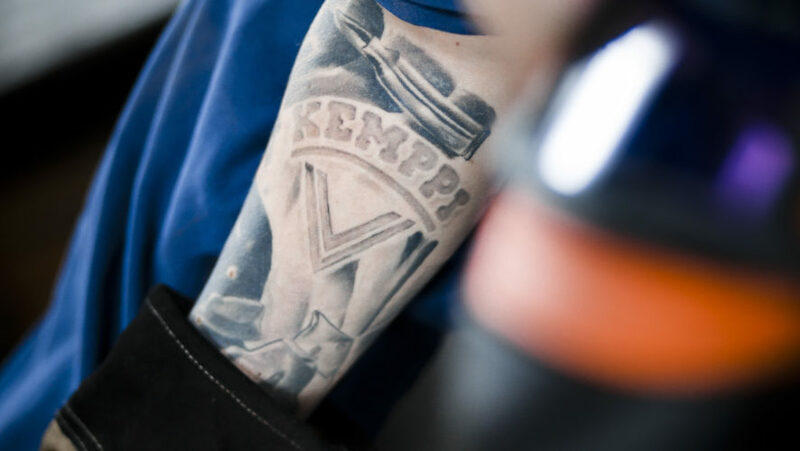 So, what is the story behind the Kemppi logo tattooed on Katja’s arm? Katja got her first job in welding in 2001. With the recession in 2008, she became unemployed once again. This time the fall did not feel as horrible. This time she had a profession she was good at and that she wanted to do. There was a Kemppi machine also at Katja’s home. It stood on the yard year-round. 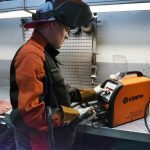 Despite the snow and rain, the welding machine kept working year after year. “Kemppi was needed for housework. My father had a transport company and a farm. Saturdays were repairing days.” The Kemppi machine was used to repair paddocks, trucks, tractors and more. When Katja Vironen later bought her own car and rented a garage with her friends, her father’s Kemppi was borrowed on many weekends. If Katja had to choose only one Kemppi, it would be the old MasterTig or the newer MasterTig MLS. Even after many years, there is always something magical about the electric arc. 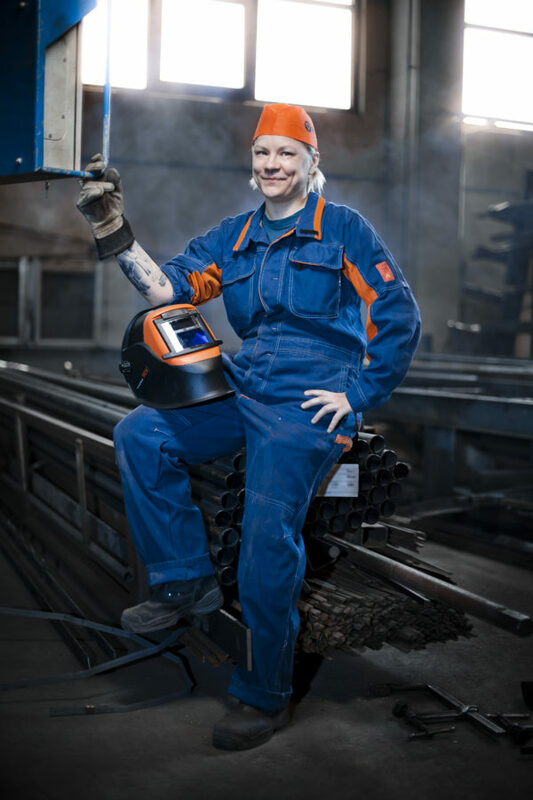 “I have always been restless, but when I grab the welding torch, I calm down.” And the more challenging the job, the easier it is for Katja to focus. Katja’s career has included many challenging jobs both on land, under water and in the air. When the Clarion hotel was being built in Helsinki, Katja was for a long time the only welder who dared to weld on the sixteenth floor. While the work itself was not challenging, the conditions were. The peak was often windy and sometimes the work required a lot of reaching to the scissor lift. Fortunately, Kemppi’s machine could be carried on the shoulder, making for a reliable workmate.